India. Accomplished Tamil poet. (1890-1973 AD). 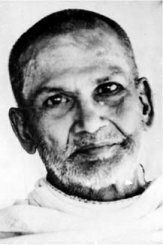 Devotee of Sri Ramana. "The only true and full awareness is awareness of awareness. Till awareness is awareness of itself, it knows no peace at all." "Is it not because you are yourself awareness, that you now perceive this universe? If you observe awareness steadily, this awareness itself as Guru will reveal the Truth." for the benefit [of all living beings]. who releases us from [our ignorance]!" and became my Lord and Master."